Kentucky Sen. Rand Paul, a Republican candidate for president, told Baltimore County Republicans at their annual fundraiser Tuesday night that the GOP needed to broaden its reach. Paul said his party was good on the Second Amendment and the right to bear arms but maybe it was time to focus on more. With a focus on the Bill of Rights, Paul suggested more votes would come from more support for the First Amendment and religious freedom, the Fourth and the right to privacy, and the Fifth and Sixth amendments, which he referred to as the “justice” amendments. The Baltimore County Republican Party’s annual Lincoln-Reagan Dinner was organized by the Baltimore County Republican Central Committee, which raised $68,500 in the last election cycle. Baltimore County gave almost 60% of its vote last year to Hogan, and it took four seats in the Maryland General Assembly from the Democrats, one of the party’s most important gains. Paul argued too much power has been shifted to the president. “Checks and balances were probably one of the most important things the founding fathers gave us,” said Paul, arguing President Obama has continued the collapse of the separation of powers. The result, Paul said, is the “biggest threat” to America, unchecked federal spending accumulating into national debt. Paul referred to his plans for Economic Freedom Zones, which would reduce taxes for businesses located in areas like Baltimore City and Ferguson, Missouri. Paul also lashed out at the Democratic frontrunner, saying his biggest disappointment with Hillary Clinton — who will officially launch her presidential campaign Saturday — was her handling of the 2012 Benghazi attack on a Libyan consulate in which the U.S. ambassador was killed. “From her inability to give us security for our troops, from her denying troops, denying reinforcements, it should forever preclude her from being president,” said Paul. 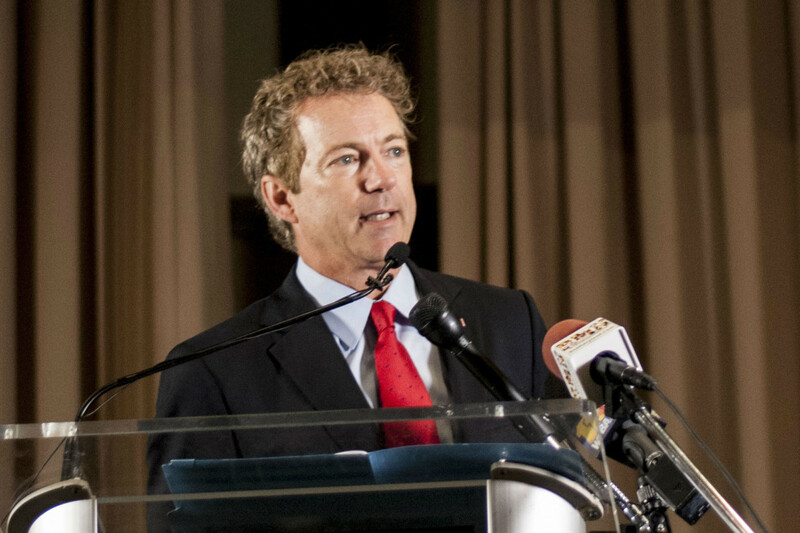 Regardless of political party, Paul said all voters need a commander-in-chief who will defend the country. Prior to Paul’s appearance at the fundraiser, Maryland Democratic Party Chair Bruce Poole issued a statement claiming Paul is not for the for middle class families he claims to represent.